Cut salmon into bite size and set aside. Soak glass noodles with warm water for about 10 minutes and strain. Slice onion, garlics, also peel and slice carrot. wash button mushroom, trim off the stems and cut into wedges. Boil chicken broth, water, lemon grass, onion, garlics and kaffir lime leaves in a pot then simmer for 15 minutes. Add in carrot and mushrooms, boil for 1 minute then season with tamari, salt, black pepper and lime juice to taste. Then in a seperate pot boil some water with 1 tsp of salt, blanch salmon cubes for about 3 to 4 minutes. Remove salmon and set aside. 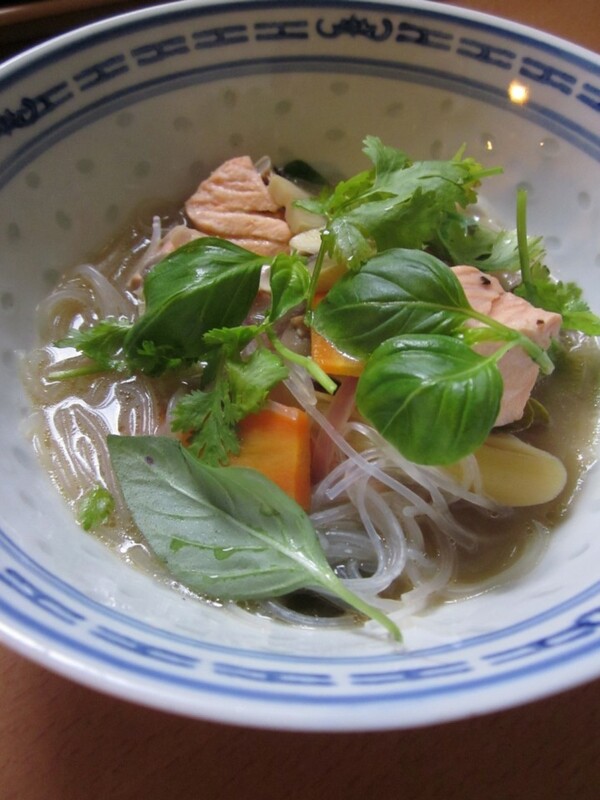 Arrange 2 bowls with beansprouts, glass noodles, some carrots, button mushrooms and salmon cubes. Pour hot soup over, garnish with thai basil, coriander on each bowl. NOTE:You can also use cod or red snapper instead of salmon. You can also use ordinary soya sauce instead of tamari and add a few drops of fish sauce.